Advocating for the ageing: BallyCara’s, Marcus Riley, addresses the UN in New York. Photo: Supplied. 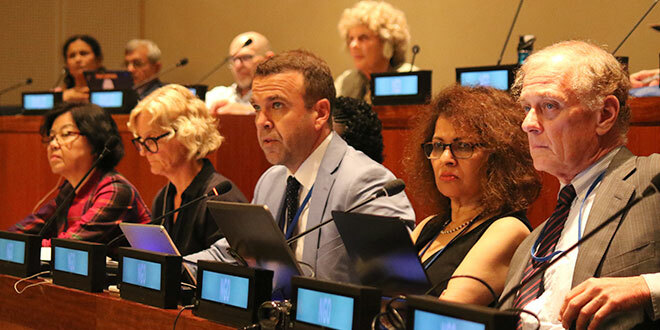 BRISBANE’S Marcus Riley told a United Nation’s forum in New York that access to quality long term care and palliative care were crucial to the global ageing society, and urged the elimination of elderly discrimination and neglect. Mr Riley, chief executive officer of BallyCara that provides retirement living, residential aged care and community care in south-east Queensland, is also chairman of the Global Ageing Network, representing 24,000 organisations in 52 countries. Speaking to the UN’s 9th Open-Ended Working Group on Ageing, Mr Riley highlighted the importance of creating systems governing long term care that created choice and opportunities for the elderly to maintain their independence. “Academic research in Australia on ‘happiness in long term care’ has demonstrated it is possible for people to maintain independence and be autonomous even in a high-care environment,” he said. “However effective legislative policies, funding systems, education and accessible resources are needed to ensure such outcomes. Mr Riley said “the vast majority of care and support throughout the world is provided by individuals – family, neighbours, or other caregivers – often unpaid and informal”. Still in his early 40s, Mr Riley, a Catholic father of three, has become a leading advocate for the ageing, since becoming chairman of the Global Ageing Network two years ago. The number of older people over 60 years is expected to double to more than two billion in 2050. In developing countries the aged population is expected to triple during the next 40 years, and make up more than 80 per cent of the entire global aged population. At the same time, the number of “older old” persons – defined as 80 years and over – in the developed world will reach unprecedented levels. Mr Riley said age discrimination would grow unless governments and society to respond. “Older persons commonly experience complex forms of exclusion and marginalisation based on a range of intersecting inequalities that reinforces discrimination,” Mr Riley said, delivering a statement during a debate session of the United Nations Economic and Social Council. He said older people should be recognised and have full participation when planning and designing Sustainable Development Goals – a set of 17 global goals set by the UN to end poverty, protect the planet and ensure that all people enjoy peace and prosperity. He also urged that SDG-focused activities work to eliminate neglect and discrimination towards older people throughout the world. “At what age should a person lose his or her rights?” he said. “At what age should a person be considered less deserving of health care, social protection, adequate housing? “At what age should a person be considered less valuable? Mr Riley also delivered a UN briefing at an OEWG about BallyCara and it’s holistic Sona philosophy. Sona is Gaelic for happiness. BallyCara strives to build in-depth knowledge of residents’ unique backgrounds, and build individualised programs based on their passions, strengths and abilities. The Sona approach aims to foster motivation, energy, and hope to ensure progressive happiness.